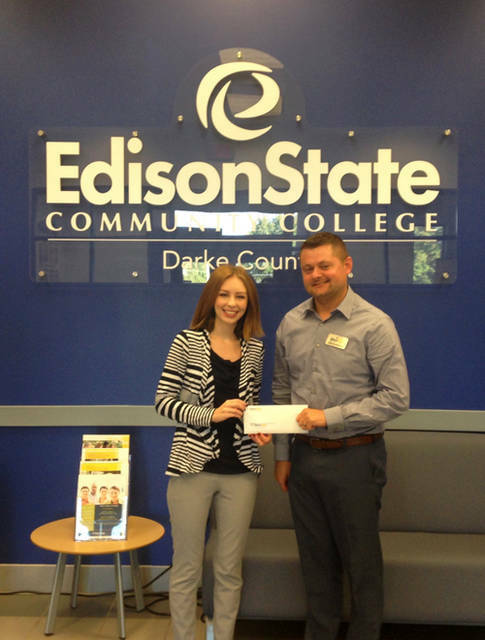 Chad Beanblossom, vice president of regional campuses, presents Edison State Community College’s donation to Crysta Hutchinson Bloomingdale, executive director of Main Street Greenville. GREENVILLE – Main Street Greenville recognized Edison State Community College as one of the Platinum Sponsors for the upcoming 15th annual Hometown Holiday Horse Parade on Nov. 17. Now in its fifth decade of service, Edison State Community College is committed to providing higher education and advanced training opportunities for the people of the greater Miami Valley. Edison is accredited by the Higher Learning Commission and is recognized with the highest order attainable by the Ohio Board of Regents. With campuses in Piqua and Greenville and plans to open two additional locations in Eaton and Troy, Edison State provides a personal experience and rewarding education. Visit Edison online at www.edisonohio.edu. Main Street Greenville also thanked the many other local businesses who help to sponsor this annual event, a full list of sponsors can be found on its website. This year’s Platinum Parade Sponsors are Edison State Community College, Greenville Federal and Wayne HealthCare. Visit www.MainStreetGreenville.org or follow Main Street Greenville on social media for more information about the organization and the upcoming 15th annual Hometown Holiday Horse Parade. Anyone with questions may contact Main Street Greenville at 937-548-4998 or info@mainstreetgreenville.org.